There is nothing more effective at making your house feel like fall than making it smell like fall. 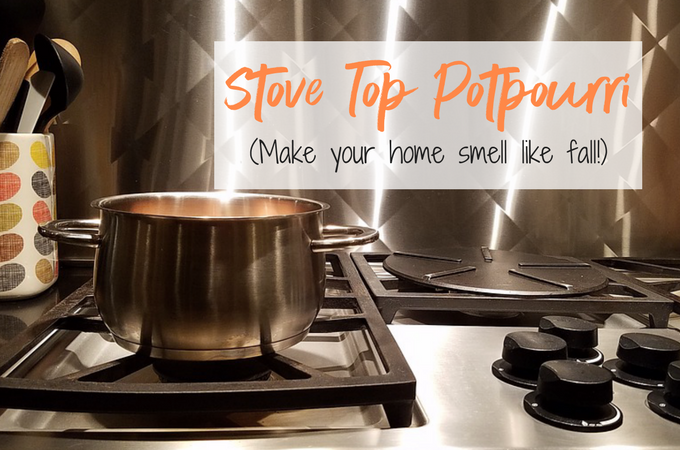 In a pinch I’ll use my wax melts or candles, but this is by far my favorite way to make our home smell AMAZING. The sense of smell is so powerful. We’ve all come across smells as adults that bring us back to our childhood, and this is one of them for me. It just makes me feel like I’m at home! It’s so easy to make, and you can use the same little batch of ingredients for a couple of days. The best part is, it’s chemical and smoke free. Just be careful to not let it boil dry..keep an eye on it. Another great way to do this (especially if you’re concerned about forgetting it on the stove) is to use a mini crock pot. The amounts of these ingredients are up to you. I use a small sauce pan, half full of water. One or two cinnamon sticks, and roughly a teaspoon of the nutmeg, and all spice. Throw in a few whole cloves and the peel of one orange. If you have an apple that is looking a little sad, it’s PERFECT for this! You know what else this is perfect for? A little housewarming gift, or something to go along with a postpartum gift for a new mom (post on this topic coming soon…). The ingredients are going to look a little weird in a zip lock bag, but they’ll love you for it! Just dump the ingredients in a little pot of water and simmer over medium-low heat!